Last month, Logitech passed me 2 Logitech products for review. I think they also make perfect gifts for home owners, provided it’s within your spending budget. 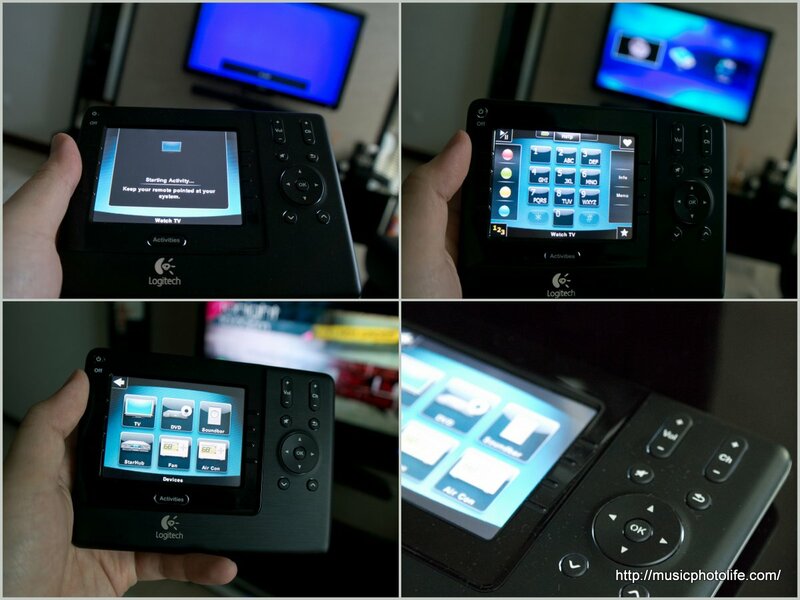 Before you impress your guests with this touch remote, you need to spend some time programming. An instruction sheet is provided in the package to help you in the setup process. After installing the software on your computer, make sure you have a reliable network connection while doing the configuration. I was using a test laptop which had an awful Wi-Fi connectivity and it broke the remote setup process a few times. The easy part about the set up is that once you have entered the model number of your home devices, the Logitech software goes online to download the appropriate configuration. No physical learning is required, which is great if your existing remote is spoiled or lost. I was pleasantly surprised that the software could offer suggestions for my devices that do not come with model numbers, like my StarHub Cable TV Hubstation set-top box. After I made the Harmony 1100 learn a couple of the buttons on the StarHub remote, the Logitech software prompted me a few model options and I found the “StarHub Smart TV” option for me to choose. I am very impressed with online database of remote control programs. It even has the KDK ceiling fan remote (probably a very popular model)! I did encounter a hiccup with my Panasonic air-con remote. The on/off command did not work properly, but fear not. The Harmony 1100 allows me to customise the keys on top of the downloaded programs. Once you have finished setting up the required devices and customisations via the software, just plug the Harmony 1100 to the USB and initiate the upload. And you are ready to impress! I’m glad there are ample hardware buttons to let me navigate the remote quickly, while leaving the resistive touch screen for the more dynamic and graphical options. 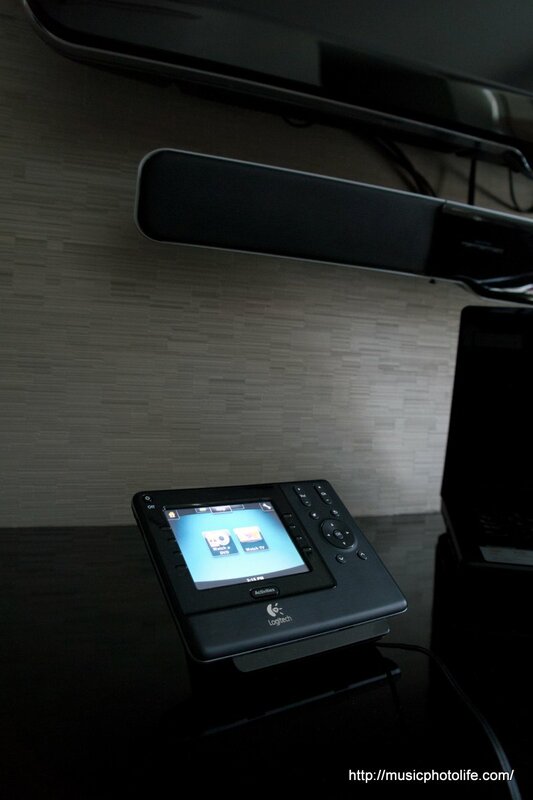 The major benefit of using a universal remote like the Harmony 1100 is that you are able to activate several devices at once by selecting a pre-programmed “Activity”. For instance, you can set up “Watch DVD” activity, which I have configured to turn on both the TV and DVD player and set the TV input to “HDMI1”. So when I press “Watch DVD”, the Harmony 1100 sends all these commands consecutively to all the devices. 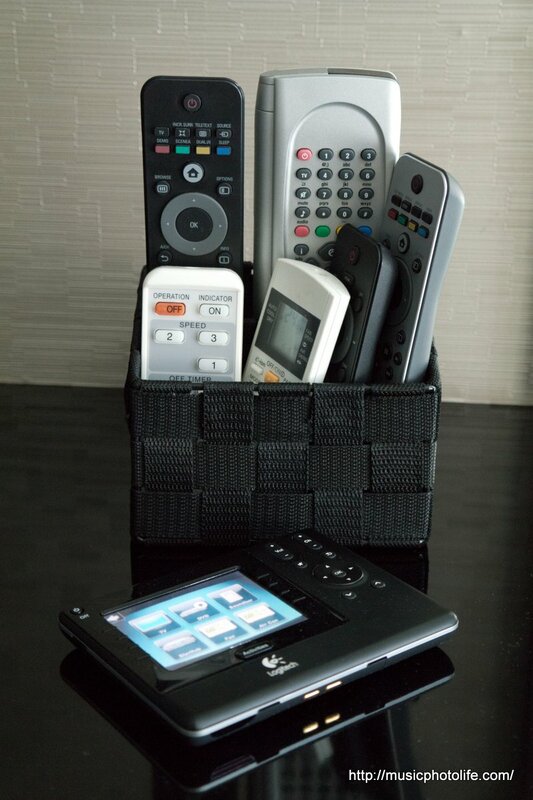 My favourite part of this universal remote is that I can switch off ALL my devices with just one press! There is just one minor inconvenience. If you want to control one of the devices, you need to select the device on the Harmony 1100 and scroll to the desired command on the touchscreen before you can activate it. My wife finds it easier to just pick up the device’s original remote and press the button directly. When not in use, the Harmony 1100 can be placed on the charging dock to charge the replaceable battery. For S$599, this gadget is for the tech-savvy home owners who appreciate convergence and style. This next home device is much more affordable and a lot easier to get it working. In fact, all I have to do is to remove the Unifying receiver from the battery compartment, insert to any computer’s USB port, let the computer install some drivers, and the keyboard is ready to work out of the box. 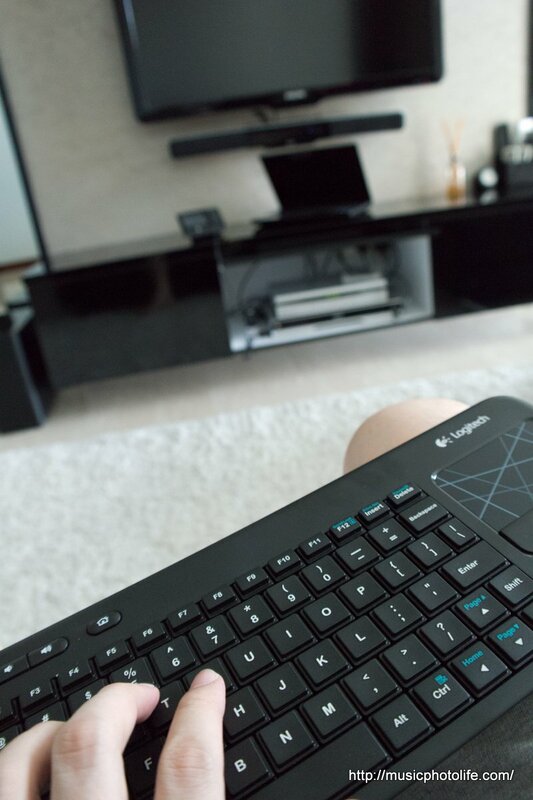 A wireless keyboard like this is useful if you hook your computer to your TV screen, so that you can operate the computer while seated on the sofa. The wireless keyboard works without noticeable lag. I find the 3.5″ trackpad very responsive and adequately sensitive, and multi-touch gestures work great. The left- and right-mouse buttons are located below the trackpad, and I like the additional left-click button located at the top left corner of the keyboard, allowing me to do the left click while supporting the keyboard with both hands, as pictured below. In the interest of making the keyboard compact, Logitech has resized and repositioned some of the keys. As a result, I am not able to type as instinctively as I would. I also find myself accidentally tapping on the trackpad while operating the keys to the right (I have the tendency to use my index or middle finger on keys like backspace, enter). I’d wish Logitech has provided the ability to disable the trackpad on-demand. 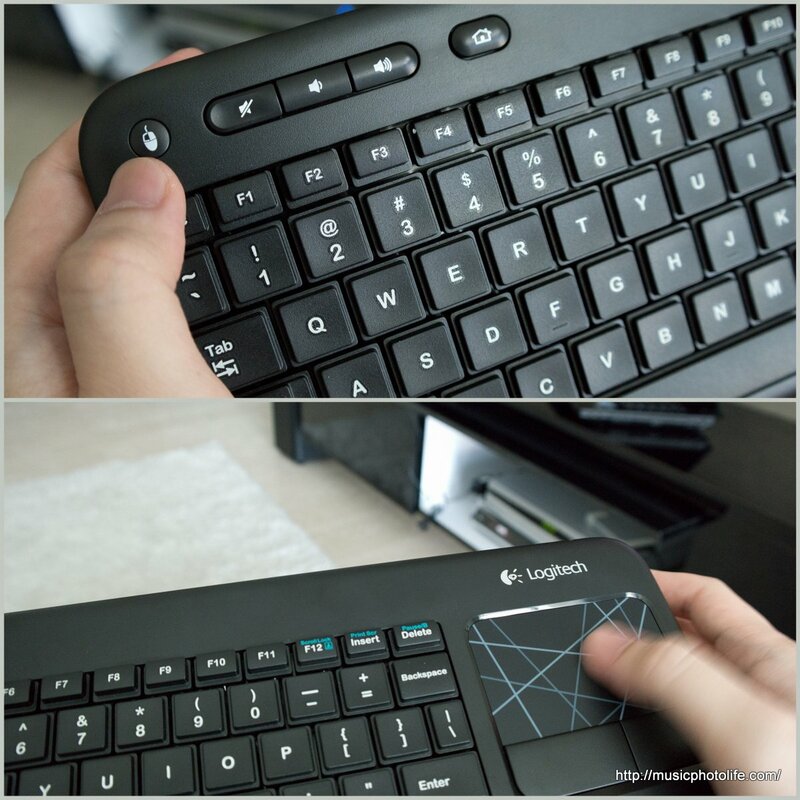 I’ve always perceived Logitech as computer products, but in recent years, they have expanded their product solutions to cater to the home and personal consumer market. Besides universal remote devices, Logitech also sells great quality earphones like the Ultimate Ears series UE600vi which I reviewed last year. Personally, I like Logitech products, for they represent quality and affordability. Do you have any positive experiences with Logitech products? Which Logitech products are your favourites?